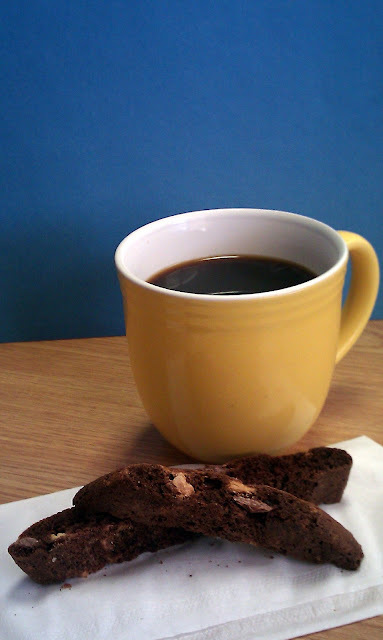 I have been on a bit of a Biscotti kick lately. It's crunchy, sweet, yummy and goes perfect with that morning coffee, or afternoon coffee or late night coffee. Plus, there is something about it that seems like a little bit of an extravagant treat on any otherwise normal day. I can totally picture myself somewhere other than work ... like a bistro in France or relaxing on my couch on a rainy fall day with a book (most likely a cookbook), or entertaining guests for a summer brunch. Of course, in that last scenario, I have an amazing house with an outdoor stone patio right outside of the kitchen that everyone is enjoying the fabulous brunch with flowers and the sun shining and lots of laughter and fun conversation and...well...you get the picture. Enjoy baking these chocolaty treats and imagine where they could take you. Line baking sheet with double thick tin foil. Sift flour, cocoa, baking powder and salt into bowl and set aside. Using electric mixer, beat sugar and butter until combined and add eggs, one at a time, then add vanilla. Blend in flour mixture and once combined, stir in semisweet and white chocolate by hand. Drop dough by heaping spoonfuls unto prepared sheet in two 10-11 inch strips, spacing about 3 inches apart (you will need this b/c it does expand while baking). Using metal spatula or wet fingertips, shape strips into 11 by 2 1/2 inch logs. Refrigerate for 30 minutes. Preheat the oven to 350 degrees. Bake logs until tops are cracked and dry and tester inserted into center comes out clean, about 25 minutes; cool 10 minutes. Reduce heat to 300 degrees. Using foil as a helper, lift logs onto work surface. Re-line baking sheets with clean foil. Using serrated knife, gently cut warm logs crosswise into 3/4 inch thick slices. Arrange half of slices, cut side down, on each prepared baking sheet. Bake biscotti until just dry to touch, about 8-10 minutes. Turn biscotti over and bake again until top is dry to touch, another 8 minutes. Cook on sheets and store in an air-tight container for up to 3 weeks.